Probably the most distressing spiritual dilemma that human beings have to face is the great question of why God allows certain things to happen. The artist asks, “How could it be that one gender has been excluded for over two thousand years from significant worship in temples until recent times?” Grossman envisions an inclusive God with hands openly giving us an addendum to the Ten Commandments that addresses women. 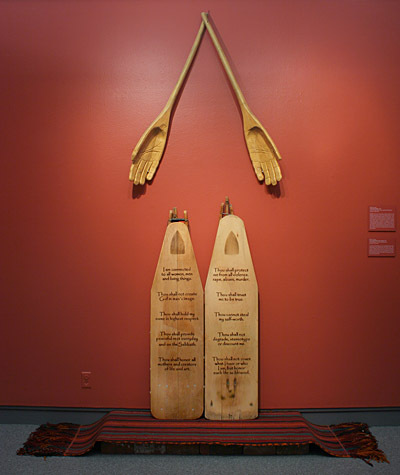 These hands are carved from wooden grain shovels referring to the “staff of life” and the evolution of domestic faith where women find the sacred in the process of making bread and sustaining their families. A Jewish woman bends over her ironing board with deep concentration and constant back and forth motion. She is busy working while the men are at schul (synagogue) praying. Her labor becomes like davening (praying) and she knows there must be a ten commandments for women. She continues the marks of her labor by burning her truth in to the ironing boards.